I have been collecting pieces of Franciscan Desert Rose dinnerware since the 1950's. 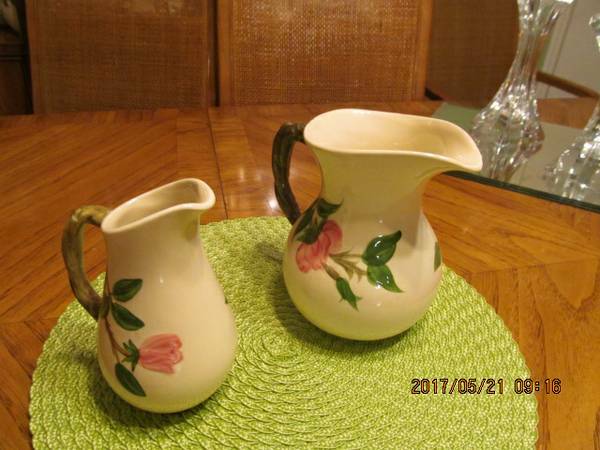 In this listing, I am selling a small pitcher (6-1/2" tall) for $15 or best offer (other than a small chip on one side, it is in very good condition), and also a syrup pitcher (6-1/8" tall) for $25 or best offer that is also in very good condition. I will sell these pieces separately as well. See the photo for more details.